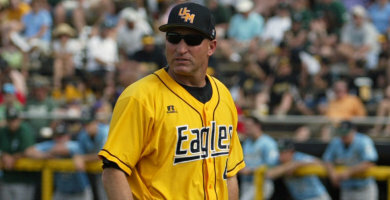 A familiar face takes over at the helm of the Southern Miss baseball program for 2010 as Scott Berry was promoted to the head coaching position in May of 2009. Berry replaces Corky Palmer, who announced his retirement as the Golden Eagle coach last season after 12 seasons leading the Southern Miss baseball team. Berry has been Palmer’s right-hand man for the last nine seasons at Southern Miss, and it is no coincidence that the school is in the midst of the most successful run in school history advancing to seven consecutive NCAA regionals, while winning the 2009 Atlanta Regional and Gainesville Super Regional to advance to the 2009 College World Series. Berry came to Southern Miss prior to the 2001 season. Since he joined the staff, the Golden Eagles have garnered a 356-204 (.636) record while advancing to NCAA postseason play seven times. The team also won the Conference USA Championship in 2003. In his tenure at Southern Miss, Berry’s main responsibility has been working with the pitching staff, mentoring four pitchers to seven All-American honors, including at least one All-American in four consecutive years from 2003-06. He has also coached three pitchers to freshmen All-American honors and saw 13 pitchers drafted into professional baseball. Prior to joining the Southern Miss staff in 2001, he was the head coach at Meridian Community College where he amassed a 186-57 mark. In his four years as the head coach at MCC, Berry guided the Eagles to the NJCAA World Series twice, won the Region 23 Championship three times and captured the Mississippi/Louisiana Championship all four years. Berry was named the Regional Coach of the Year three times (1997, 1998 and 2000), District Coach of the Year twice (1998 and 2000), while earning the Diamond Sports ABCA Region Coach of the Year in 1998 and the Louisville Slugger Coaching Award two times in 1997 and 1998. The GoldenEagles.net netwrok is not affiliated with the University of Southern Mississippi. It was created and registered on the 10th of May 1999 for the personal enjoyment of the Golden Eagle Nation.